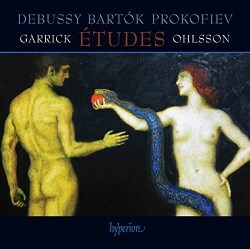 Honestly, Garrick Ohlsson and Hyperion were made for each other; I’ve already reviewed their Griffes – one of my Recordings of the Year 2013 – Granados and Scriabin, all of which impressed me enormously. I’ve dubbed Ohlsson a ‘pianistic prestidigitator’, but he’s not the only magician here; time and again Hyperion have conjured up some of the best piano sounds imaginable. Philip Martin’s Gottschalk, Marc-André Hamelin’s Rzewski and, most recently, Stephen Hough’s Grieg spring readily to mind. With that sort of pedigree this new album is bound to be a winner. Appropriately enough for studies designed for ‘remarkable hands’ Debussy’s delectable dozen kicks off with five-finger exercises after Czerny. Surely those of us who tried to master the piano at an early age will remember pecking out those scales – tongue protruding, perhaps – but what follows would have required a great deal more talent. These are not dry-as-dust performances, for wit and whimsy are part of Ohlsson's repertoire as well. Whether focusing on thirds, fourths, sixths or octaves he blends crystalline textures with the kind of rhythmic fluidity that lifts and animates this music at every turn. Factor in fearless dynamics and a marvellous feel for Debussy’s musical shapes and you would be forgiven for thinking you’d died and gone to heaven. I really can’t imagine a more complete and compelling traversal of these pieces than this. Each has its own character – skittish or mock-serious, rollicking or reflective – and all are explored in full and vivid detail. Pour les sixtes is a particular delight; its dark ruminations in the left hand and bright rhapsodising in the right do indeed seem to convey the world in miniature. Not only that, Ohlsson has a flair for the dramatic – what attention-getting octaves – yet he steadfastly refuses to overplay his hand. The splendid recording is just as well-behaved, effortlessly embracing Debussy’s stormy chords and sunlit arpeggios. As for the repeated notes of No. 9 they always put me in mind of Gottschalk’s touch-fest Tremolo; indeed, I’d love to hear Ohlsson play some of the Creole Chopin’s more extrovert pieces. Moving on, I simply can’t recall a more complex mix of shades in No. 10. The wonderfully tactile recording – timbres are so true – really comes into its own here and in the restless perambulations of No. 12. How do you follow that? With Prokofiev’s nose-thumbing Études, of course. Remarkably for such an early opus these four studies demonstrate the composer’s ability to juxtapose the laconic and the lyrical; the pounding figures of the Allegro are supplanted by a seamless – if searching – Moderato. Ohlsson rejoices in the angularity and drive of the anything-but-typical Andante and the frankly seditious dissonances of the Presto. Goodness, what scorching statements from one so young, and how perfectly Ohlsson articulates them all. And just when you think your jaw couldn’t drop any further Ohlsson dashes off Bartók’s Op. 18 with all the clarity and passion these pieces deserve. This isn’t the kind of subversive talent one recognises in Prokofiev, say, but it certainly marks out the Hungarian as a bold and uncompromising musical presence. That’s just the way Ohlsson sees this music; no quarter asked for, none given. Throw in Roger Nichols’ highly readable liner-notes and a super-slick download process and you have a piano album to die for. Dazzling pianism, class-leading sound; another notch on Ohlsson’s bed post.